Precious metals are rare, naturally occurring metallic chemical elements of high economic value. Chemically, precious metals are less reactive than most elements. They are usually ductile and have a high lustre. Common examples include gold, silver, platinum, and palladium. A metal is deemed to be precious if it is rare. The status of a “precious” metal can also be determined by high demand or market value. Precious metals in bulk form are known as bullion and are traded on commodity markets. The defining attribute of bullion is that it is valued by its mass and purity rather than by a face value as money. Many countries mint official bullion coins. Bullion coins minted by national governments have some numismatic value in addition to their bullion value, as well as certification of their purity. The demand for precious metals is driven not only by their practical use but also by their role as investments and a store of value. Historically, precious metals have commanded much higher prices than common industrial or “base” metals such as copper or aluminum. Gold and silver, and sometimes other precious metals, are often seen as hedges against both inflation and economic downturn. When it comes to retirement, you want to make sure that your money is there for you. To better understand this concept, watch this American Bullion commercial. Many of American Bullion’s clients contacted us because they wanted to protect their retirement portfolio with precious metals. Clients often believe the stock market is overinflated and have a sentiment that a bubble in the stock market may burst soon, decreasing their portfolio value. Inflation is a nasty word because it erodes the purchasing power of the U.S. dollar. It means that the consumer goods we buy on a day-to-day basis, such as food or gasoline, take more dollars every year to buy. In the year 1920, a 1-oz. gold coin and a $20 bill were worth the same and each would have bought a man a custom tailored suit. However, due to inflation, that same 1-oz. gold coin can still buy a custom tailored suit but the $20 bill cannot. Many investors are waking up to the fact that over time the dollar has consistently lost purchasing power due to the government’s Quantitative Easing (QE) programs. Think of gold as long-term protection of your purchasing power. When you combine inflation with what’s on the horizon with Social Security and Medicare needing further bailouts, it all adds up to one thing: the national debt is expected to keep growing. At its current level of $18 trillion, many believe the national debt has become unstable and unmanageable, which may result in panic setting into the market. This creates market uncertainty. Physical assets like gold have often been viewed as independent of market cycles and a hedge against market uncertainty. Because of the continued money printing that’s happening in this country, many believe the devaluation of the U.S. dollar and inflation could cripple retirement plans. American Bullion can help you learn how to safeguard your retirement for the future. 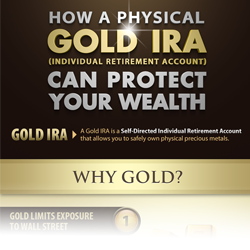 Our clients believe that the best way to protect their wealth is to open a Gold IRA. What metals should I invest in? If you’re looking for where to buy precious metals, American Bullion offers a diverse selection of precious metal bars and coins. However, only specific bars and coins meet IRS regulations for being added to a Gold IRA. When you’re choosing which bullion bars and coins to purchase, be sure to ask one of our gold specialists which coins best fit your investment or collector needs. For a full list of IRA permissible coins and bars, contact an American Bullion gold specialist at 1-800-326-9598. Why Buy Gold from American Bullion? American Bullion is the expert in Gold IRAs and a nationally listed retailer of The United States Mint. We specialize in providing investors with a wide range of physical products delivered safely and securely to their doors. American Bullion carries all U.S and European pre-1933 coins, as well as modern gold and silver bullion in the full spectrum of currently available coins and bar products. American Bullion also carries a wide range of platinum and palladium bars and coins to match any need you may have. We are confident of our ability to safely supply you with the precise precious metal products that you are seeking. American Bullion offers a complimentary Gold Guide that will help educate you on Gold IRAs. It’s full of tips for how to buy precious metals, which metals are allowed in IRA accounts, how to liquidate your gold, the global factors that impact the precious metals market, and more. The guide is completely free, and there is no obligation. If you’ve been looking for the opportunity to safeguard your nest egg for the future, then request your Free Gold Guide today by calling 1-800-326-9598 or filling out the form at the top right of this page.